Receivers with AstroTV+ present the DTVi seal because they are able to run all interactive applications (NCL, Lua and Java) broadcasted by TV stations via digital signal. The access to channels with online videos is identical to the access of digital TV channels, bringing together the linear experience and the VoD. In other words, the user chooses what to watch and when. A selection of the best channels with on-demand content from the Internet. The offer is varied: Humor, Sports, News, Services, Offers ... Choose, install and start watching. The App Store brings together services, information, social networking and games that will make your TV even more interactive. AstroTV has evolved and is now also on tablets and smartphones. Access, in real time, all the content prepared for the Second Screen. Adds basic functions such as: Channel Scan, Closed Caption and Settings, as well as advanced features such as: EPG, Media Player and PVR. 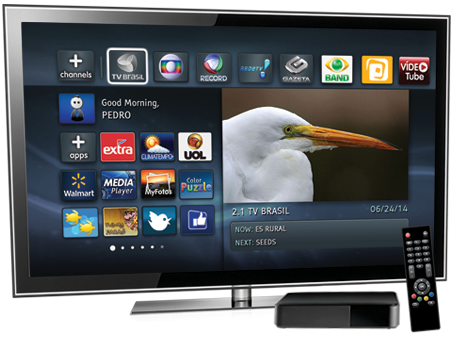 AstroTV+ is optimized for optimal performance in TV sets with digital reception and low cost set-top boxes. AstroTV+ interface adjusts to several TV resolutions, being compatible with tube TVs (4: 3 aspect ratio), Full HD and 4K (Ultra HD).